CABLE HIGHLIGHTS: HBO’s TRUE DETECTIVE topped Sunday scripted, with a 0.15 jump to 0.44, followed by CRASHING up 0.04 to 0.14, and HIGH MAINTENANCE up 0.02 to 0.08. Nickelodeon’s 11AM SPONGEBOB was at 0.35. Adult Swim’s TIGTONE was at 0.34/0.31 compared to last week’s 0.34/0.28. TNT and TBS tag-teamed for the night’s programming, with the SAG AWARDS respectively at 0.30/0.30 (compared to last year’s 0.41/0.36, followed by a “sneak peek” of the first episode of I AM THE NIGHT at 0.17/0.11. 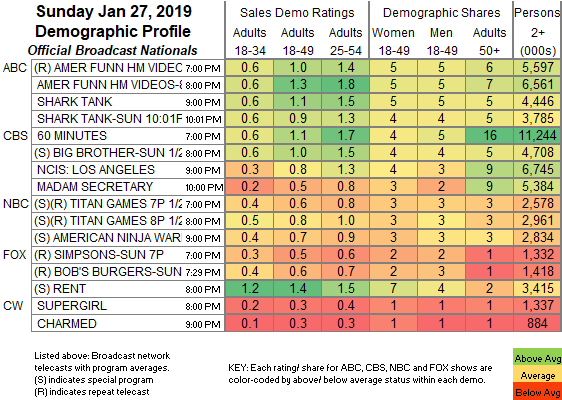 On Showtime, SHAMELESS gained 0.04 to 0.30, BLACK MONDAY climbed 0.03 to 0.11, and SMILF ticked up to 0.07, while THE CIRCUS returned at 0.07. On Starz, the season finale of OUTLANDER ticked down to 0.23 (the last season finale was at 0.30), and COUNTERPART was down 0.03 to 0.05. NatGeo’s VALLEY OF THE BOOM was at 0.07 and an off-chart 0.04/146K, compared to last week’s 0.05/0.05. Unscripted was led by ESPN’s coverage of the PRO BOWL at 0.84, down 0.16 from last year. Bravo’s REAL HOUSEWIVES OF ATLANTA had a 0.17 leap to 0.83. ESPN’s NBA game was at 0.71. On Food Network, WORST COOKS IN AMERICA climbed 0.09 to 0.46. On ID, THE LAKE ERIE MURDERS rose a tenth to 0.42, and EVIL LIVES HERE was up 0.08 to 0.36. HGTV’s line-up was led by BEACHFRONT BARGAIN HUNT at 0.40/0.38, compared to last week’s 0.24/0.22. 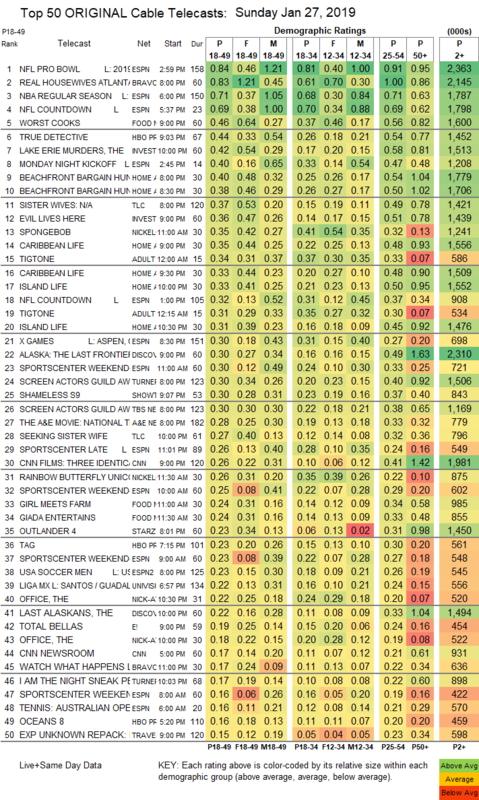 On TLC, SISTER WIVES lost 0.03 to 0.37, and SEEKING SISTER WIFE was down 0.02 to 0.27. On Discovery, ALASKA: THE LAST FRONTIER grew by 0.09 to 0.30, and THE LAST ALASKANS was down 0.02 to 0.22. E!’s TOTAL BELLAS ticked down to 0.19.